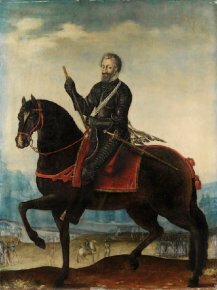 20/7/10 – Acquisition – Paris, Musee de l’Armee – With an estimate of 120 to 150.000 euros at Sotheby’s Paris last 22 June, the Equestrian Portrait of Henry IV (ill. 1) painted by Marin Le Bourgeoys remained unsold. 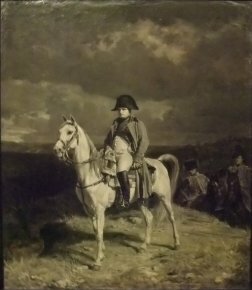 However, it was acquired after the auction by the Musee de l’Armee. Previously considered to be an anonymous work, the artist’s signature was rediscovered about twenty years ago during a restoration. There is only one other known painting by Marin Le Bourgeoys, an Allegory with Helmeted Woman, a canvas fragment held at the Museum in Lisieux. “Peintre ordinaire” to Francois de Bourbon, Duke of Montpensier, then as of 1594 painter and valet to the king, first Henry IV then Louis XIII, Marin Le Bourgeoys is also familiar for having invented mechanical objects : arms (arquebus, crossbows, rifles…), musical instruments (lute), celestial and terrestrial globes… The Musee de l’Armee owns several arms signed by him or produced in his workshop. The exact circumstances for the commissioning of this portrait are not well known, and the besieged city in the background has not been identified. The painting now hangs next to Henri IV’s war armour and arms, not far from the weapons created by Marin Le Bourgeoys. We take this opportunity to comment on the reorganization and reopening of the museum rooms covering the period between 1815 and 1871 (from the Cent Jours to Napoleon III) which took place on 20 March 2010 and not yet pointed out on our site. The presentation is well done and the extensive number of works on display (ill. 2) is particularly welcome. 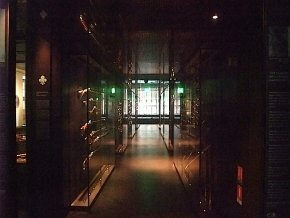 We do regret though the overly somber colours of some of the walls and the insufficient lighting, particularly in the main hallway (ill. 3) displaying arms which, unlike costumes, do not suffer from being exposed to light.